« Bringing in the New Year with a Green Monstah! 1. Green Monstah smoothies- Seriously, I’ve had one for breakfast everyday this week and have gone through more almond milk in the last week then I ever did regular milk. Good thing these things are healthly. 2. C.O. Bigelow Coconut Lip butter- so yummy. so rich. so totally addicted. 6. Gotye- Somebody That I Used to Know. GAH! I’ve listened to it like 800 times. I need to have the internet taken away from me. Also, I’m on another A Day to Remember kick. They need to come to Boston, right now. Press the tofu overnight if possible. (I’ve taken to putting mine in my tofu press and then forgetting about it for a day or two. It comes out super solid and doesnt have the wierd jiggly texture). Heat your olive oil in a skillet over medium heat. Saute the onions until soft, about 3-5 minutes. 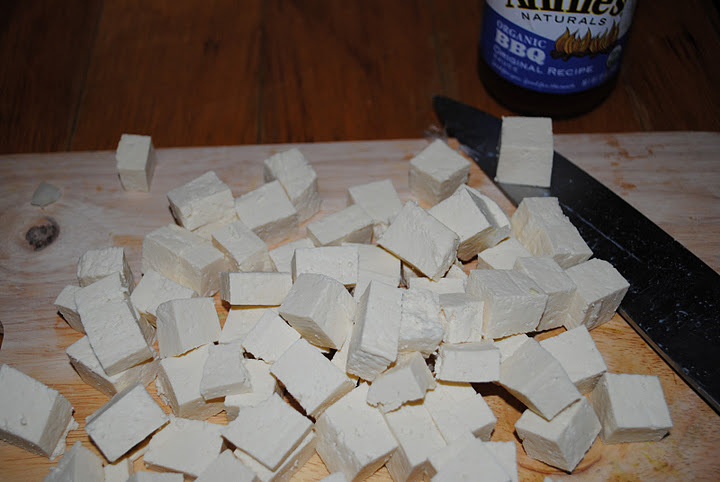 While the onions are softening, cut the tofu in bite size pieces. Add them to your skillet once the onions are done. 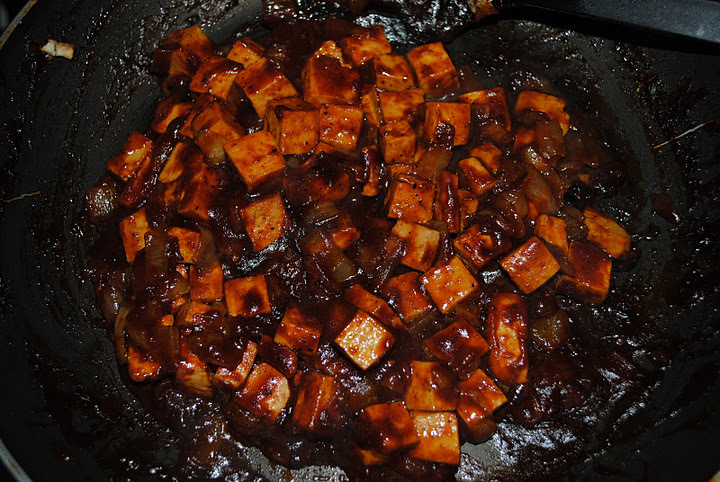 Let cook for about 15 minutes until the tofu has began to get brown. Add the BBQ sauce and reduce heat so that the BBQ sauce is simmering. Let simmer for about 25 minutes, stirring occasionally and making sure to scrap the bottom well so nothing sticks and burns. Mix in about a handful or two of cheese, as much as you like. Stir and let the cheese melt. Assemble the rest of your sandwich while you wait, lining the pita halves with lettuce and thinly sliced tomatoes. 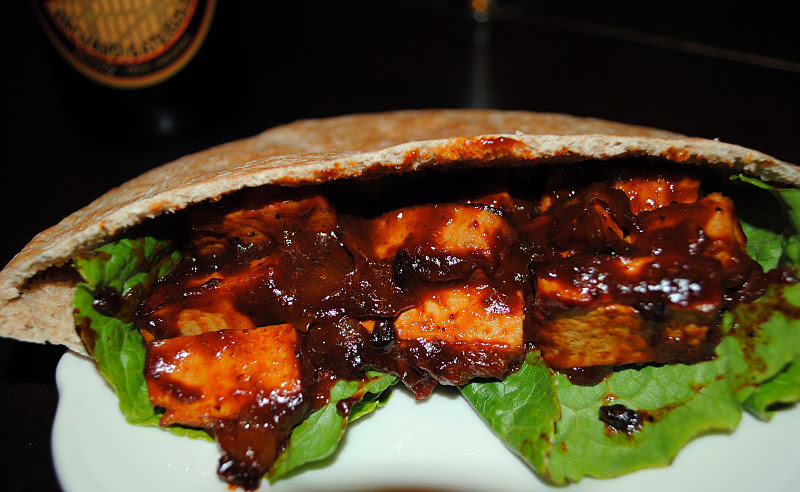 When the cheese is melted, add the BBQ tofu. Shove unceremoniously in your face and watch the BBQ sauce get everywhere! 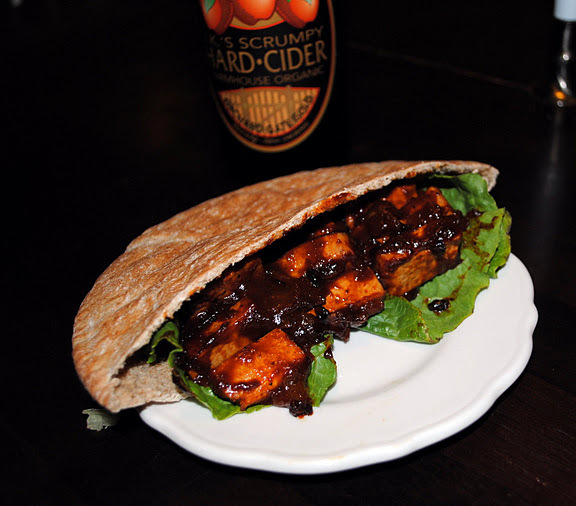 Though I’ve been eating this all week and I adore it, I think next time I would used a whole wheat wrap. The pita pocket has been falling apart on me , though its possible its just the brand I bought. Either way, my lunches have been an extreme mess and I even got BBQ sauce on my copy of Hunger Games. Not. Cool. So DEFINITELY make this, but maybe when you are in the privacy of your home or when well stocked with napkins! Is a tofu press really a necessary accessory when cooking with tofu? I found what looks like a really easy tasty recipe for crispy salt and pepper tofu, but I’m totally intimidated cause I’ve never used it before. Thoughts? Hey! A tofu press is not necessary. You can also press tofu with plates- put some paper towels or napkins on a plate, put the tofu down, put more paper towels on the tofu and then put a plate on top of the tofu and let that sit for an hour or so. You may have to change out the paper towels. Pressing the tofu just makes it firmer. I like the tofu press because you put the tofu in it, put it in the fridge and then forget about it for as long as you want but you have to press tofu a lot for it to be worth it. I know plenty of people that go the plate route. Bring me the horizon has their own vegan BBQ sauce.